This final article will conclude our series on stargazing and rudimentary navigation using heavenly bodies. There’s no end to the depth of this subject, though. From ancient hands we’ve been passed marvelous star lore, intricate treatises on planetary sympathies, and all manner of alchemical, esoteric, and symbolic meanings associated with the stars, the planets, the sun and moon, and the seasons. Learn on! And don’t forget to love the dearest globe of stardust we know: the earth. “If the Sun rises in the East in Aries, it is Aries that is known to be RISING over the horizon at DAWN. At midday, the Sun (still in Aries) will have moved to its height overhead but, as Aries moves across the sky with the Sun, so ANOTHER SIGN will be rising in the East over the horizon. 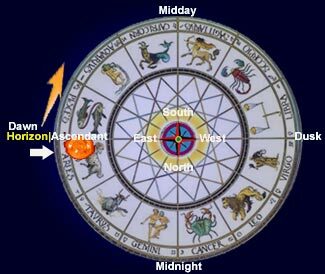 As the Sun moves, so the complete Zodiac moves, and a different Sign will continuously be seen to be RISING in the East. This occurs right up until dawn the following morning. See the pattern here? 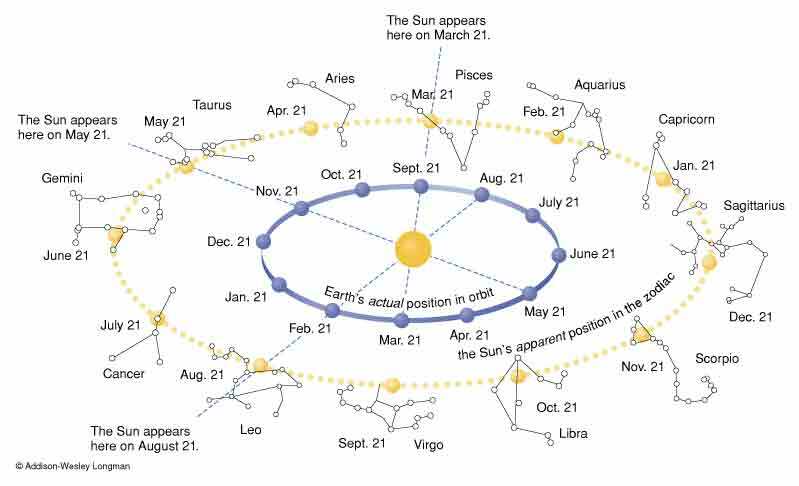 Using the elliptic (the course of the sun, see previous article) and the wheel of the zodiac you should be able to fairly successfully predict which zodiac constellations will be visible at any given time of the year. Then, instead of taking it from paper to mind to sky, you’ll soon be able to take it directly from sky to mind, and determine exactly what time of the year it is by examining the constellations rising and setting at night. Some of the zodiac constellations are very faint, totally undetectable in areas with light pollution. Others are fairly easy to spot even in the city. Get acquainted with their formations and their order, starting preferably in winter when constellations like Gemini and Taurus are easily spotted using the constellation Orion, as we’ll explain below. Orion the hunter is easily recognizable, and like Ursa Major the Great Bear has a stunning pan-cultural significance relating to the hunt. Even cultures which don’t see a giant man outlined in the hourglass figure have seen his famous three-star belt as a string of hunted animals. The Shoshone have the legend of the three mountain goats, Orion’s sword imagined as an arrow shooting through the center of the three. The Seri people had a similar legend, calling the belt Hajpi (a name denoting a hunter), although instead of only mountain goats they imagined a mule deer, a pronghorn, and finally a bighorn in procession. The Rig Veda also imagines Orion as a deer. Whatever the significance, whether hunter or hunted, humans have been entranced by Orion for ages. and brings the fortified city to ruin. It reckons Christ’s words in Mark 13:2, “‘Do you see all these great buildings?” replied Jesus. “Not one stone here will be left on another; every one will be thrown down. '” Music to my ears, music of wild birds and shimmering leaves. “If you can find the big dipper in the sky, you have a starting point for identifying many other objects in the sky. Learn to use it as a starting point for the finding other constellations. The Pointers: The two stars forming the front edge of the Big Dipper’s bowl (on the side away from the handle) point to Polaris, the north star, in the constellation Ursa Minor (the Little Bear). Polaris is a rather faint star about five times farther away than the distance between the pointers themselves. If you continue on this line from the Pointers on past Polaris, at an equal distance, and slightly to the side, opposite the big dipper, you will intersect Cassiopeia. Cassiopeia, Queen of Ethiopia, is a stretched out W-shaped constellation reclining in the starry band of the Milky Way. Cassiopeia is circumpolar, like the Big Dipper, and therefore is a familiar constellation, easily learned, visible no matter what the season of time of night from most of the United States. Cassiopeia may also be found by tracing a line from Mizar (ζUMa) (the second star of the Big Dipper’s handle) through Polaris. Trace a line from the Pointers of the Big Dipper to Polaris and past Cassiopeia, and you will come to a large, nearly perfect square of four stars (almost directly overhead in autumn) called the Great Square of Pegasus (Pegasus was a flying horse). At one corner of the Square of Pegasus is Andromeda (daughter of Cassiopeia). The constellation Andromeda contains the Andromeda galaxy, also known as M31. The Andromeda galaxy is relatively close to the Milky Way, and is a bit larger than our own galaxy. “Arc to Arcturus.” Follow the curve of the Big Dipper’s handle away from the bowl to the fourth brightest star in the earth’s sky, Arcturus, of the ancient constellation Boötes (pronounced “boo-oh-tees”). Boötes is a herdsman, or shepherd, and is found in cave paintings commemorating successful hunts of gazelles, zebras, and giraffes in the Sahara–this constellation was named before the Sahara became a desert. Arcturus is best seen in late summer. Continue past Arcturus on the same curve away from the Dipper’s handle. After going the same distance again as it took to reach Arcturus, you will come (if it’s not below the horizon) to a bright star of the constellation Virgo called Spica (spy-ka). “Speed on to Spica!” is a handy way to remember this. Alternatively, the phrase “Spike to Spica” refers to Spica’s usual location near the horizon. Spica lies nearly on the ecliptic–the path the Sun follows across the sky. Spica may have an occasional bright visitor nearby–a planet wanderer, not a permanent resident! Return to the bowl of the Dipper. A line running through the two stars nearest the handle points almost directly to two other notable stars. Pointing down beneath the bottom of the Dipper bowl the line would take you to Regulus, the brightest star in the constellation Leo (a lion, whose mane looks like a backward question mark–Regulus is the “dot” at the bottom of the mark). End quote. Since these instructions also point to Gemini, we’ve come full circle on the year wheel once again. 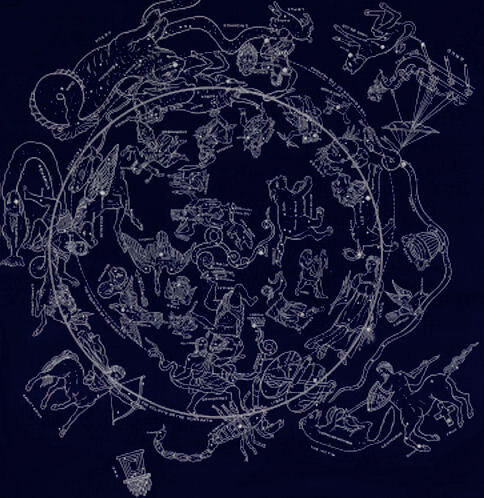 Corresponding the two diagrams above should allow you to fill out the rest of the zodiac, and any other constellations you pursue through the night sky like Orion the hunter, or the Great Bear and her cubs. 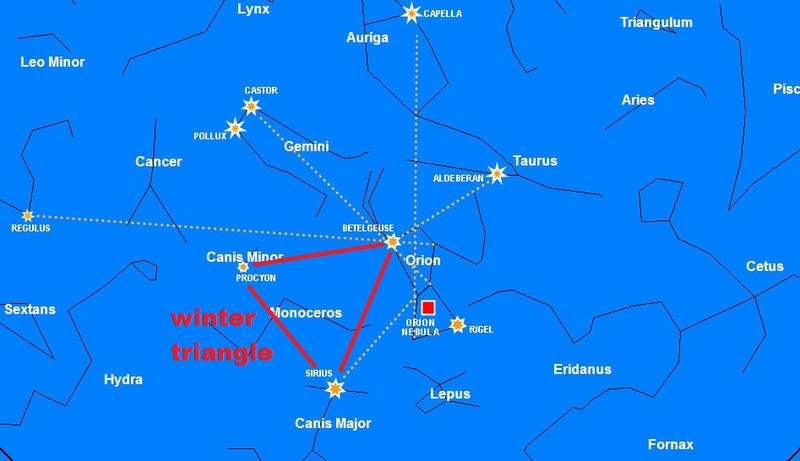 Note that the summer triangle also overlaps the Milky Way, and along wtih the winter triangle they form a very simple duo with which to follow the seasons. The waltz of the planets is far too baffling and sporadic for me to follow or explain with ease. They’re easy to spot, though. First of all, they don’t twinkle like stars do. They give off a rather steady shine. Venus is easy to locate, being both the morning and evening star (which Bertrand Russell made such a hubub about in his philosophy of language). Also, they don’t stay in a fixed orbit in the celestial sphere, so they will frequently change position in relation to other stars. 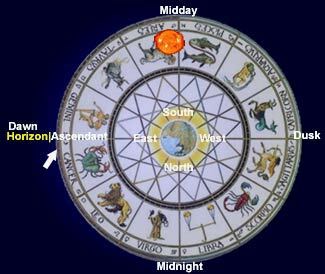 These are some basic instructions on getting in tune with the rhythms of the seasons and the significance of cardinal directions by observing the heavenly bodies. Why? To move freely without map or compass, by season and sun rather than by signpost and streetlamp. To remember an era we all share in our souls, of which Chaungtzu wrote, “During that time mountains had no paths or tunnels, lakes had no boats or bridges, all living things lived in groups and felt a sense of connection with their communities, birds and beasts grouped together and vegetation flourished. If someone put an animal on a leash it was merely to take a stroll with them. If the branch holding a bird’s nest was drawn down it would be merely to delight in looking at it.” Or simply for nothing. For nothing. Not to be deluded by dreams. and their tyrants come, many times before. the least ugly faction; these evils are essential. By dreams of universal justice or happiness. and his history … for contemplation or in fact … Often appears atrociously ugly. I come to realize that mind is no other than mountains and rivers and the great wide earth, the sun and the moon and stars. It is the stars not known to science that I would know, the stars which the lonely traveler knows. This entry was tagged big dipper, constellations, naked eye, navigate, navigation, orion, planets, star lore, stars, summer triangle, ursa major, winter triangle, zodiac. Bookmark the permalink.